Immanual Church on the Hill is a building in the colonial style, and finding a position for the organ was not an easy task. 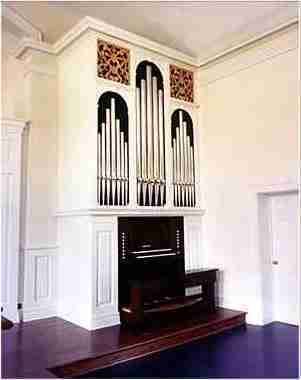 By providing the instrument with a white case and by blending in the cornice mouldings to follow the mouldings in the church, an elegant solution was found to what otherwise might have been an unacceptably bulky appearance. Although modest in size, this instrument has proved remarkably versatile both in liturgical and concert use. The instrument has suspended key action, mechanical drawstop action and a Dom Bedos tremulant to the Swell organ. In spite of the limited height, it proved possible to dispose the two manuals one above the other, thereby ensuring better balance and projection into the church than would have been the case if the Swell had been placed behind the Great. The Cremona is a useful stop, combining with the chorus to provide a bold effect almost like a Trumpet, there being no space to accommodate a Trumpet in the limited space available. The Sesquialtera on the Swell Organ not only offers an added musical dimension, but also affords that department with an unexpectedly Full Swell feel to it. Space being limited, the lowest octave of the Swell Gedackt are made of wood and screwed to the outside of the swell box, with the mouths speaking into the box. 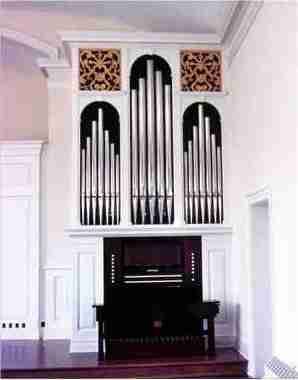 View the Specification of the Immanuel Church on the Hill organ (completed 1994).